Notes: Cans of paint and paint supplies. 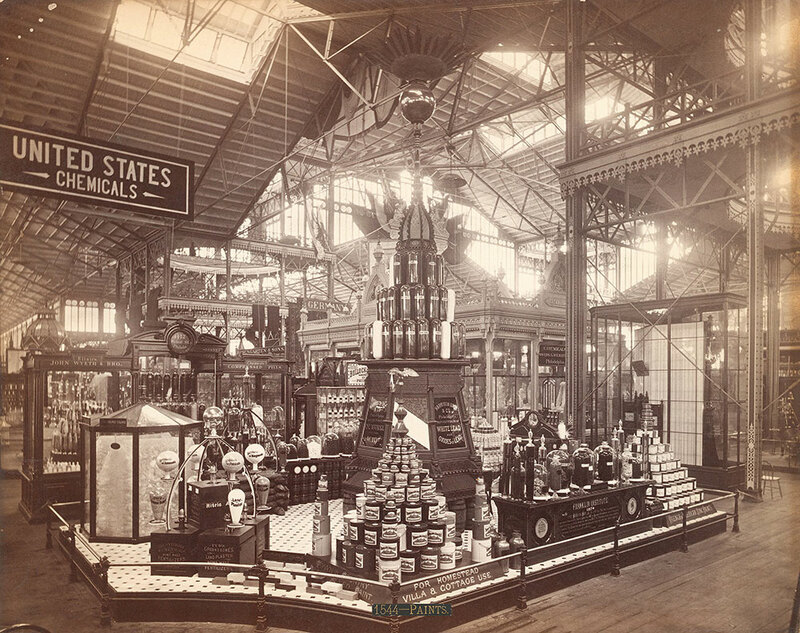 In background are exhibit showcases for John Wyeth & Bro., the chemical company Powers and Weightman, and the pharmaceutical company Bullock & Crenshaw. Notes: Exhibit titles: Harrison Brothers & Co., Philadelphia, Exhibit #13; John Wyeth & Bro., Philadelphia, Exhibit #32; Powers & Weightman, Philadelphia, Exhibit #12; Bullock & Crenshaw, Philadelphia, Exhibit #22, Main Exhibition Building, Bldg. #1. Notes: Title on label: Paints.